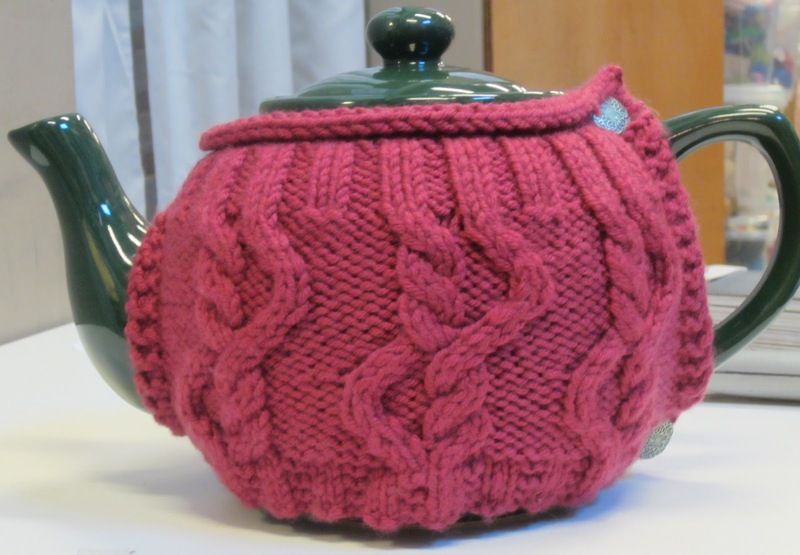 I started this tea cozy on September 23rd and finished it on September 25th. It’s a very quick knit and now that I’m more familiar with the pattern, the two additional cozies that I have knit were finished in a day. I did run into a mistake in the cable directions, and the corrections have been added to the Debbie Bliss website. 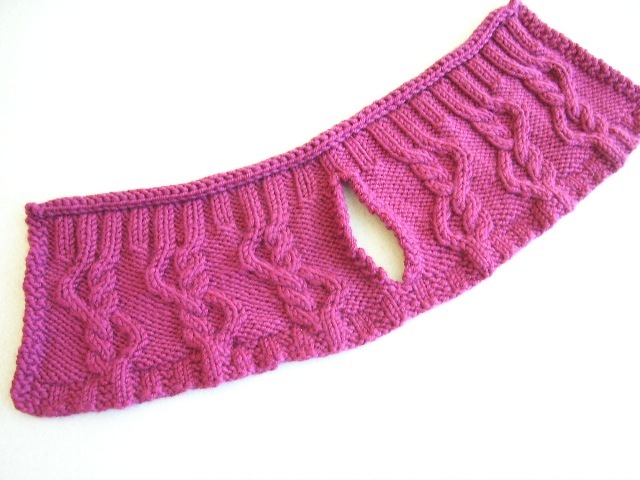 I did catch one remaining mistake: the final buttonhole row is missing the yarn over after the knit 2 together. I used a pair of antique looking buttons from the shop, but this would be a great way to use up any stray buttons in your stash. I think a mis-matched pair would add a touch of whimsy, especially if it was paired with a bright colored yarn. For the version pictured here, I used Debbie Bliss Rialto Aran, and very little of the 50 gr ball was left when I was done. Other good yarns would include: Encore (the worsted weight does increase the size so it does not fit as nicely on the tea pot, but I believe going down a needle size to US 5 and US 6 would solve this). I’m always a fan of using yarn that can be machine washed (especially if the item is intended to be a gift) so I would recommend a washable DK or worsted weight for this project. 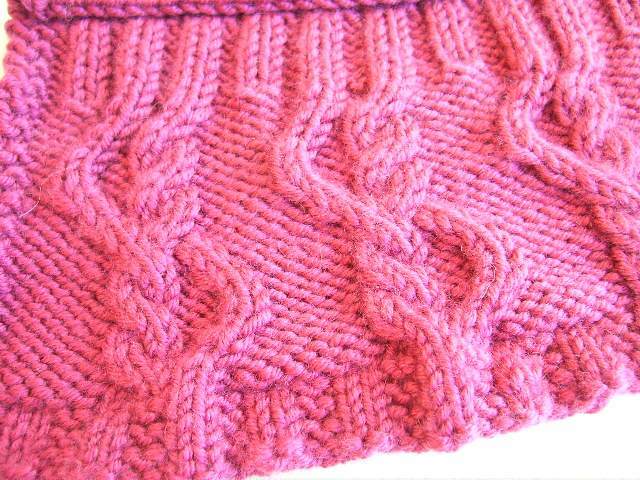 The name of the pattern is a bit of a misnomer in this case, because I knit it out of Misti Alpaca Tonos Worsted. 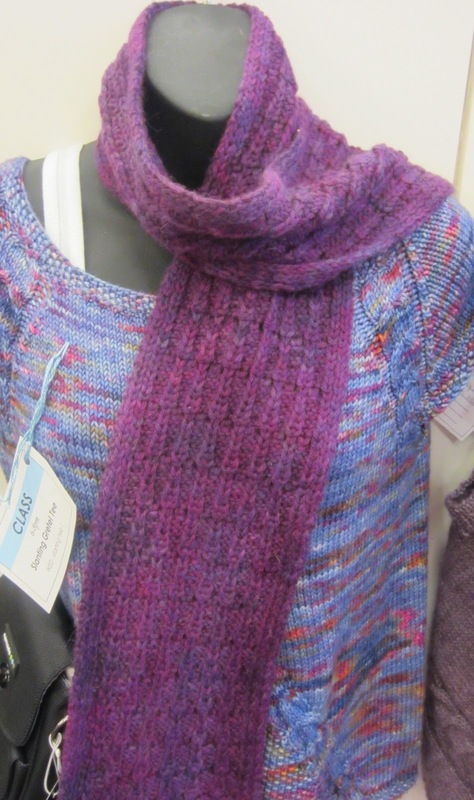 I loved knitting this scarf – and I didn’t pick the yarn or pattern. First of all, I have never met an alpaca I didn’t love. It’s soft, smooth and feels great on your hands when you knit it. My first project out of an alpaca yarn ruined me for cheap acrylic yarn for life! 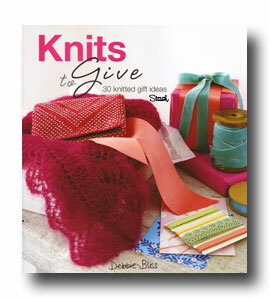 But, more about the pattern, which comes from Luxury Yarn One Skein-Wonders. 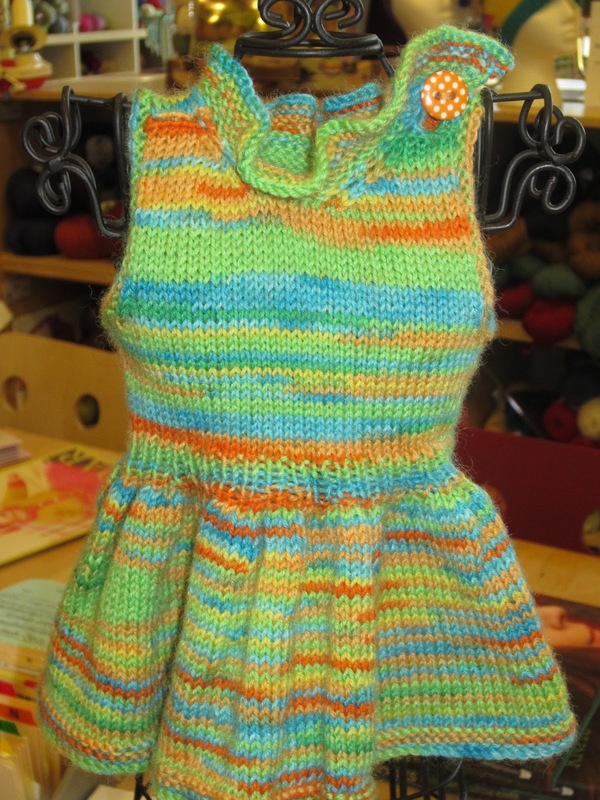 This is one of those bonus patterns that looks complicated but is actually fairly simple. 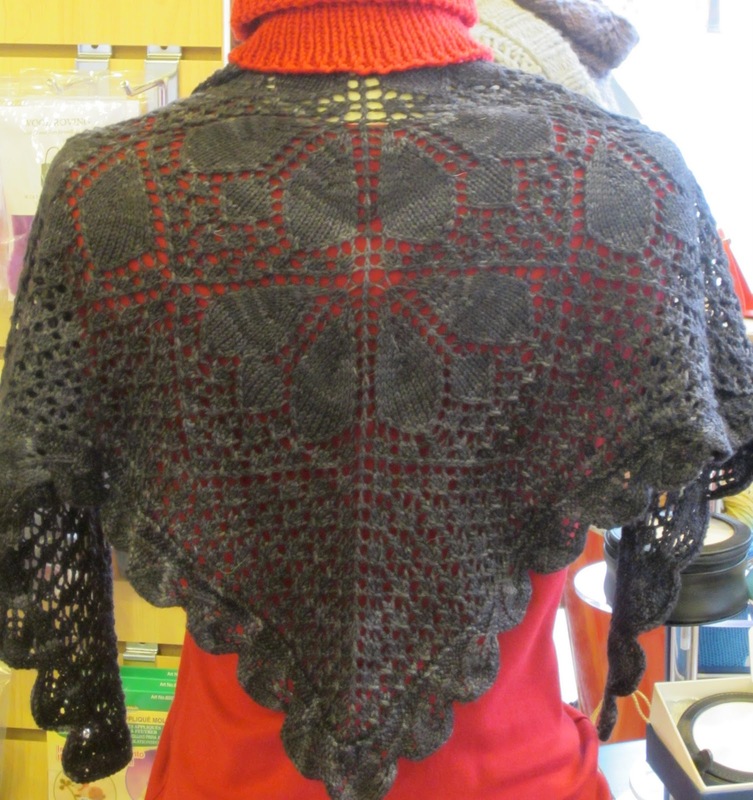 In fact, I would recommend this pattern to someone who hasn’t done much lace. There are only 3 different rows of instructions, and 2 of them are all knits and purls. The end result is a pretty lace and the way the decreases are spaced, they give a “mock-cable” look. It was very satisfying and knit quickly. The pattern said to knit for 40” which is “long enough” but I kept going until I ran out of yarn so mine is slightly longer (44″). An added bonus to this pattern is that it looks good on both the “right” side (the left photo below) and the “wrong” side (right photo). I am a bit of a sock yarn addict. I enjoy making socks, especially in the summer because they are transportable and small enough that you aren’t buried under pounds of wool in the summer. Plus when you buy enough yarn for a pair of socks can also make “something else”. 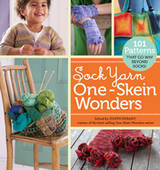 Which is one of the reasons Sock Yarn One Skein Wonders is a fun book – it helps you with the “something else” part. I picked this pattern because I thought the lace was pretty, and I wanted to see what it would look like in a less busy yarn. I chose the Dream in Color Smooshy with Cashmere in the tonal black. With the cashmere it was really a pleasure to knit. The lace is fairly challenging, so it isn’t conducive to a lot of multi-tasking, and I recommend putting in life lines just in case you need to back up. 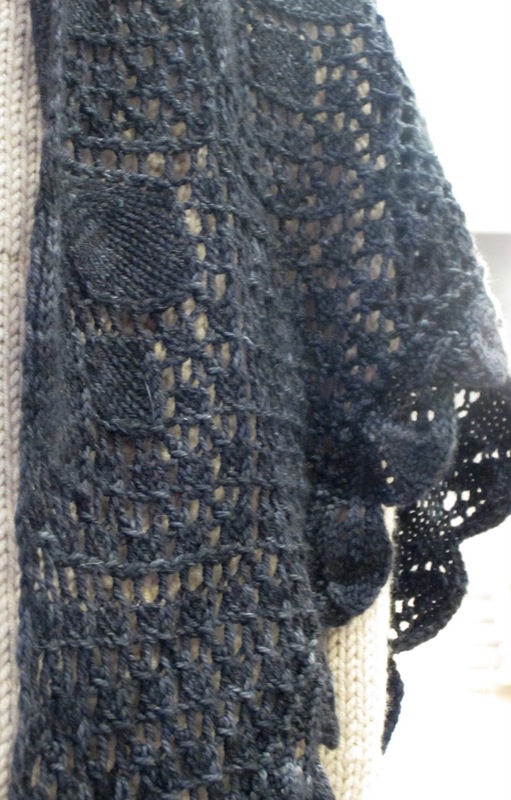 Even with the complicated lace, it knitted up fairly quickly because of the small size – and the prize at the end is the lacy border which was really fun. 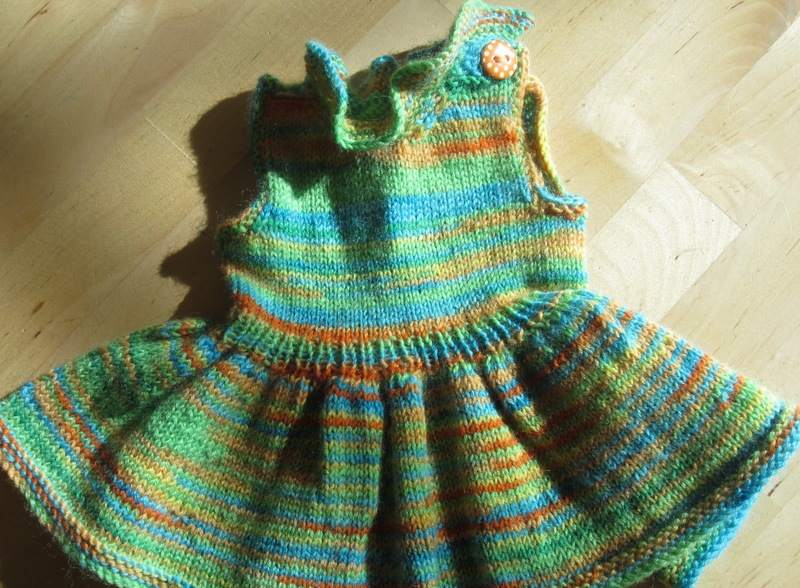 I enjoyed knitting this, and am really pleased with the end result. This dress is designed for an 18” doll. I have no personal experience with the American Girl dolls, but I am pretty sure this dress would fit one. I knit it out of Regia Flusi. It took one skein. It was great yarn to use and the color is so much fun. I think any doll would be proud to wear it to any summer picnic to which they were invited. 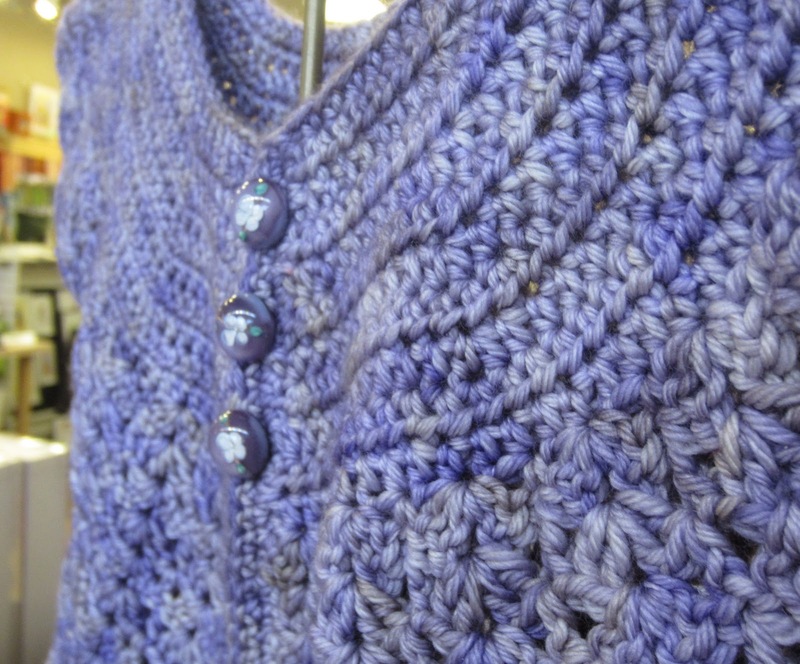 I knit it on US 2 needles; I think I would use US 3 needles next time because I am a very tight knitter. The pattern is very quick and easy. I did the sleeve holes slightly differently because I did one in the round and the other flat so I had to change the pattern so they would match (the pattern was unclear about how to do them and I prefer to knit in the round when I can). This pattern is out of Sock Yarn One Skein Wonders. 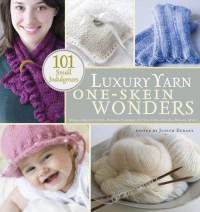 I love all the One Skein books and this one has a ton of great patterns in it. There is a large list of ones I plan to do when I get time. >This is the first blog post about some of the project samples we have completed for Desperate Gifters (our holiday promotion). 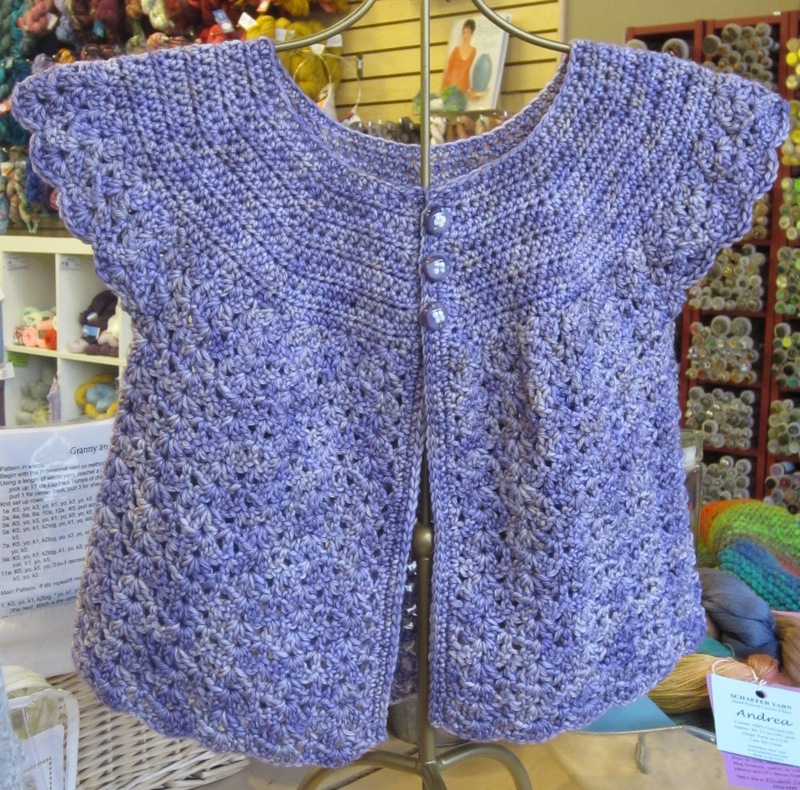 The Swing Set Cardigan from Little Crochet was one of the easiest and quickest projects I’ve made in recent times. It actually took me only one day to make from the first chain to the last stitch! I made the 18-30 month size and used the fabulous hand-dyed yarn Tosh DK from Madelinetosh. The yarn is 100% superwash merino and is scrumptious! I needed 2 skeins to complete the project. Other yarns that I think would have been lovely for this pattern are Berroco Comfort DK, Cleckheaton Country 8-Ply, or Sirdar Baby Bamboo. 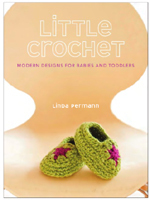 I wish I had a lucky little niece to make this for – but alas, they are all too old now.